LP Adventure 1.5 Lift Kit, Motegi MR 139 Wheels, BFGoodrich KO2 Tires, Bumper Guard, Rally Armor mudflaps! This orange wagon has a manual transmission and is powered by a 2.0L H4 16V GDI DOHC engine. Motivated by that spritely motor it gets 10.5 L/100 km in the city and uses just 8.1 L/100 km out on the highway according to Transport Canada. Our Crosstrek's trim level is Sport Manual. This vehicle has been upgraded with the following features: Lp Adventure 1.5 Lift Kit, Motegi Mr 139 Wheels, Bfgoodrich Ko2 Tires, Bumper Guard, Rally Armor Mudflaps, Body Side Mouldings. 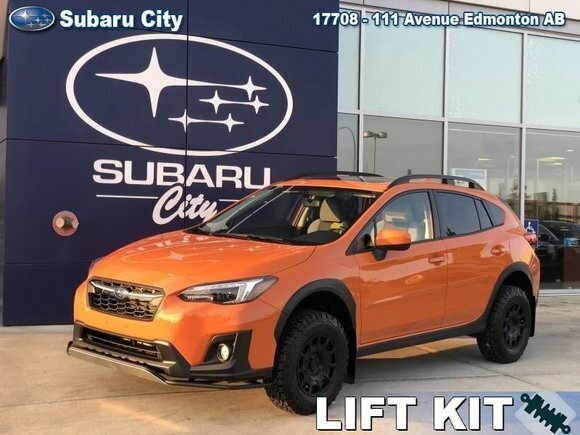 Want to try the 2019 Subaru Crosstrek Sport Manual LP Adventure Off Road Package?